A Lebanon veteran was one of five vets honored at Boston’s 7th Annual Wounded Vet Run on May 21st. 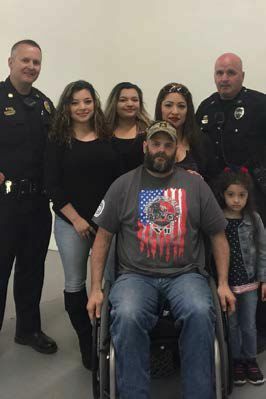 Specialist Brandon Boyd served in the U.S. Army as an infantryman during Operation Iraqi Freedom and relies on a wheelchair from spinal injuries received during combat. A hundred percent of money raised from this event goes to honor local wounded Veterans or charities of their choosing. Lebanon police officers Corporal Michael Wright and Special Officer Peter Begin escorted bikes as part of the Wounded Vet Run in Everett, MA. The Wounded Vet Run is a Police, Fire and Veteran sanctioned event and an estimated 10,000 bikes participated at this year’s run in Boston. Attorney General Gordon J. MacDonald announced today that New Hampshire has joined with 46 other states and the District of Columbia in an 18.5 million dollar settlement with the Target Corporation. Target’s November 2013 security breach accessed over 41 customers’ credit card information. New Hampshire will receive over $186,000.00 from the settlement. In addition, the agreement requires Target to maintain and support software on its network and to maintain appropriate encryption policies. A New York man was sentenced to 110 months in Federal Prison for Selling Oxycodone and Laundering Money in VT. Michael J. Foreste, nicknamed “Beast,” was convicted last October on 10 charges involving his trafficking of oxycodone and money laundering in Vermont. Court Documents showed Foreste received the oxycodone pills through a NYC police officer Andre Clark who received them from his sister Carol Clark. Carol Clark was receiving 100’s of oxycodone pills each month for a sickle cell disease. Foreste would transported the pills to Vermont and sell them on his own until April 2012 when Vermont State Police stopped Foreste and seized 659 oxycodone pills on I-91. After his arrest and conviction, Foreste started sending the oxycodone pills in Skittle bags to middleman, Dannis Hackney to sell in the Burlington area. Evidence at the trial showed the drug scheme produced more than $500,000 in profit for Foreste and was laundered between the four accomplices using various bank accounts. Foreste’s convictions and sentencing were the result of a multi-agency investigation and prosecution beginning back in mid-2014, spearheaded by Homeland Security Investigations. A Windsor VT man was arrested on Monday on multiple charges stemming from an accident in Lebanon NH last February. Lebanon Police said they responded to accident on Rt. 12A near Plainfield they located a single vehicle with extensive damage. After an investigation, they issued an arrest warrant for Christian West. West was arrested in Vermont and waived extradition back to NH. He was charged with Conduct After an Accident, Negligent Driving, Possession of Prescription Drugs, Controlled Drug Acts Prohibited, Transporting Drugs in a Motor Vehicle, and Witness Tampering. West was held on $5,000 cash bail and arraigned in Lebanon District Court on Tuesday, where he was released on personal recognizance bail.